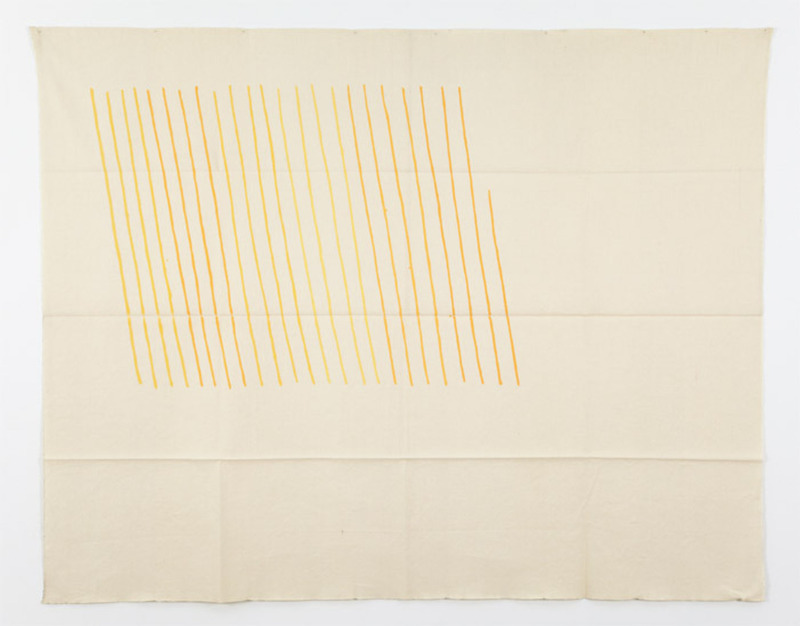 Giorgio Griffa, Obliquo giallo (Diagonal Yellow), 1971, acrylic on canvas, 69 3/4 x 89". “Fragments 1968–2012” was the first solo exhibition of Giorgio Griffa’s work in New York since 1970, and the first time since 1973 that the artist’s paintings have been shown anywhere in the city at all. Sadly, it got off to a rocky start. Just four days after the show opened last October, a five-foot storm surge flooded West Twenty-First Street, destroying Casey Kaplan Gallery’s walls and basement storage area and seriously damaging sixteen of the artist’s works then on view. But all was not lost. The exhibition reopened in early January with two cleaned and restored canvases from the original hanging, as well as thirteen entirely new selections from the artist’s studio, providing a welcome if belated introduction to the art of this underrecognized figure of European postwar painting.